Even as the tragic associations surrounding Sept. 11 continue to accumulate, it is worth noting an earlier association with the date in our region. Sixty years ago on Sept. 11, Hurricane Edna made landfall along the New England coast, hitting New Hampshire and Maine with particular fury. 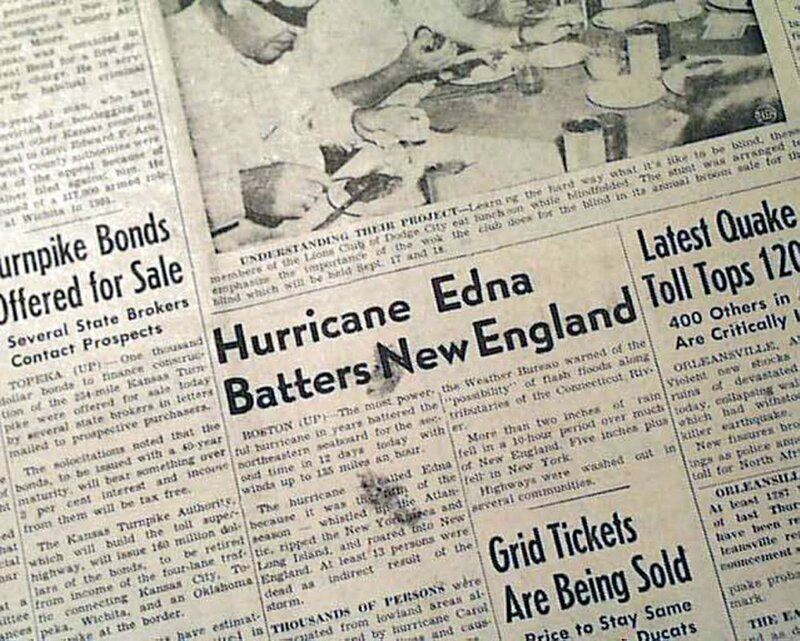 Indeed, Edna remains the most destructive hurricane to ever hit the Pine Tree State. Edna was the second destructive storm of the season. Hurricane Carol, which concentrated its destruction mostly along the southern New England coast, had caused 65 deaths and 1,000 injuries across the six states only 10 days earlier, while destroying 1,500 houses and damaging 10,000 more. Total damages from that storm reached a half-billion 1954 dollars. Only days later, just as the region was beginning to recover, Hurricane Edna, a Category 1 storm, made landfall on Cape Cod before filling the Gulf of Maine with destruction. 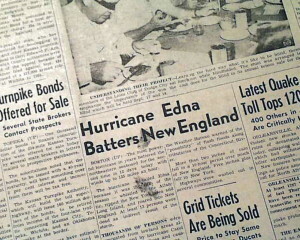 The Sept. 11, 1954, front page of The Russell (Kan.) Daily News carried an article about Hurricane Edna. According to Wikipedia, eight people drowned in Maine. In Unity, a family of 10 was trapped on top of their car, cut off by raging flood waters. A human chain of rescuers managed to save nine of them. Maine bore the brunt of the storm, with wind gusts of 74 mph topping trees and as much as 7.5 inches of rain. Flooding along the Androscoggin and Kennebec rivers washed out roads and, in Augusta, the Kennebec River ran 20 feet above normal levels. In the aftermath, many road and rail lines were cut, almost 20 percent of the state was without power, and eight people drowned. Unfortunately, that wasn’t the end for the region. Just a year later, Connie soaked the region with torrential rains just days before Diane delivered even more — up to 20 inches of rain in some parts of southern and western New England. Those storms destroyed scores of dams and nearly wiped out some towns in Connecticut and Massachusetts. Since that action-packed 12 month period, New England has fared amazingly well, with only a few major tropical storms and hurricanes reaching our shores. None has matched the terrible and concentrated destruction of the four storms of 1954-1955. While it might be comforting to imagine those events of the 1950s as simply anomalous, some researchers suggest that what has been at work is the Atlantic Multidecadal Oscillation — a long-term pattern that appears to yield periods of more intense storm activity based on rising sea surface temperature. Almost all of the most serious hurricanes in the history of the northeast have struck at times of positive Atlantic Multidecadal Oscillation, when sea surface temperature has risen above average. The hurricane seasons of 1954 and 1955 were notable peaks. Now, for the first time since the early 1960s, the Atlantic is back in an extended period of above-average temperatures. Some predictions point to SST dropping back to average levels, or even below-average as soon as 2015, but other interpretations point to a long period of above-average temperatures lasting well into the 2030s and perhaps even beyond, if sea surface temperature increases because of global climate change. Much has happened in the region since the mid-1950s. Certainly weather predictions have improved, and emergency management has advanced. For example, the Army Corps of Engineers has crafted a network of flood control dams across the region. On the other hand, the region now has more development than ever before — more cars and people to keep safe, or rescue. In short, it’s time to think about nature’s potential to surprise — and terrify — and make sure the region’s infrastructure and emergency management systems are fully prepared. Even with today’s state-of-the-art forecasting, the region might have only a few days to prepare for a catastrophe. Sixty years is a long time, but we can still learn some important lessons from those long ago storms. Eamon McCarthy Earls of Franklin, Mass., is the author of the new book, “Twisted Sisters: How Four Superstorms Forever Changed the Northeast in 1954 & 1955.” He has worked on hurricane research with the Coastal Systems Research Group at Woods Hole Oceanographic Institution.